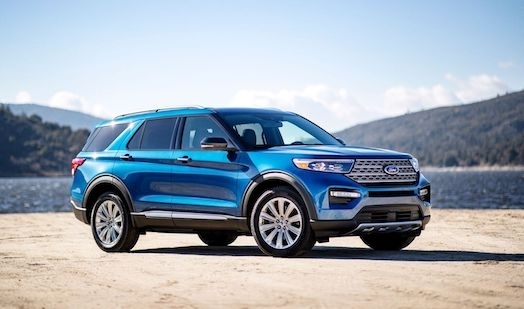 Ford today introduced its all-new 2020 Explorer at the North American International Auto Show in Detroit — a complete redesign of America’s all-time best-selling SUV — that now features the broadest model lineup ever, more power and space, and smart new technologies to help tackle life’s adventures. In addition, Ford revealed its all-new 2020 Mustang Shelby GT500, the most powerful street-legal Ford ever with a supercharged 5.2-liter V8 producing more than 700 horsepower, due to arrive in showrooms this fall. Explorer is now more capable, comfortable, sportier and roomier in all three rows thanks to Ford’s flexible new rear-wheel-drive architecture. The strengths of the all-new Ford Explorer were showcased at a special reveal event for employees, fans, dealers, suppliers, government officials, and media today at Ford Field in Detroit, where Ford brought to life how it can help American families get the most out of their road trips. The all-new SUV arrives this summer. Improved off-road capability comes courtesy of intelligent four-wheel drive and an available new Terrain Management System that features seven easy-to-engage drive modes. Powertrain offerings include a 3.0-liter turbocharged EcoBoost V6 projected to produce 365 horsepower and 380 lb.-ft. of torque using 93-octane gas, making this the most powerful Explorer ever. The Explorer lineup now features standard, XLT, Limited, Limited Hybrid, ST and Platinum models. The all-new Explorer comes packed with more than a dozen new standard features for only $400 more over the previous model. Standard features include a power liftgate, 2.3-liter EcoBoost engine with all-new 10-speed transmission, 8-inch digital touch screen with SYNC 3, FordPass Connect Wi-Fi service for up to 10 devices and more. Building upon Ford’s push to bring more driver-assist technology to market, the all-new Explorer introduces available Active Park Assist 2.0. The class-exclusive feature — standard on Explorer Platinum — allows the driver to park in a parallel or perpendicular spot with a touch of a button without having to work the steering wheel, gear shifter, gas pedal or brake pedal. Available reverse brake assist, also standard on Platinum, uses radar and ultrasonic sensors to detect an object in Explorer’s path, and can apply the brakes automatically to avoid an imminent collision when the vehicle is backing up at a low speed — such as when exiting a driveway. Ford is also introducing an entirely new generation of hybrid vehicles this year with greater performance and the ability to go further. “Reduced cargo space in hybrids is a thing of the past for Ford customers,” says Bill Gubing, Explorer chief engineer. Available in Limited edition trim, Explorer Hybrid comes with Active Noise Cancellation, Ford Co-Pilot360 Assist+ driver-assist technologies, leather seats with micro-perforation and accent stitching, second-row heated seats, a 14-speaker B&O premium sound system, wireless phone charging pad and 10-way power adjustable driver and front passenger seats. The all-new Shelby GT500 — the pinnacle of any pony car ever engineered by Ford Performance — delivers on its heritage with more than 700 horsepower for the quickest street-legal acceleration and most high-performance technology to date ever offered in a Ford Mustang. To channel power and torque to the unique carbon fiber driveshaft, Ford Performance leveraged learnings from the tuning of its Ford GT supercar’s dual-clutch transmission. The team selected a TREMEC 7-speed dual-clutch transmission, which is capable of shifts in under 100 milliseconds — markedly faster than any manual gearbox. This dual-clutch transmission is designed for a number of drive modes, including normal, weather, sport, drag and track, and activates features like line-lock and launch control through selectable Track Apps. To harness the power and torque of the most powerful Mustang ever made for the street requires cutting-edge active chassis technology, track-bred Michelin tires and Brembo brakes — all dialed in by Ford Performance. Shelby GT500 takes advantage of revised suspension geometry, a new electronic power steering unit and lighter-weight coil springs front and rear. Next-generation active MagneRide suspension is baked-in, along with the latest in advanced drive mode technologies from Ford Performance. The payoff is the highest-ever lateral acceleration from a Mustang for greater track performance and driver control.